Implant dentistry is a field in dentistry that is specialized in oral rehabilitation with dental implants. Dental implants have become very popular recently as a way to replace missing teeth. Implants are placed inside the jaw bones under the gingival margin and bridges, crowns and dentures can be placed over them. If you need dental implants you should turn to a dentist that has the proper training for that procedure. Dental surgeons and periodontists are the two specialties that practice the placement of implants. These doctors go through additional training during their residency and are perfectly capable of handling your case. Another thing you might want to know is that sometimes these dentists team up and work together. So whichever one you choose, you won’t be wrong. If you are suffering from the periodontal disease a periodontist might be a better fit. Most of the time, your general dentist will be able to guide you and recommend you a good specialist. Dental implants are a revolutionary advancement in dentistry. They are slowly changing people’s lives, with their versatility and widespread use. So if you are missing a tooth or several teeth, you might want to consider this option. Implants are small screw-like components that are placed inside the bone. These structures are meant to replace the root of the natural teeth and are finished with an artificial crown that replaces the crown of the natural teeth. Implants can be made of several materials, including titanium which is the most common one. Other materials are zirconia, other ceramics, polymers, other metals. Dental implants have a very wide use. First of all, they can replace a single tooth. It doesn’t matter where it is located. It can be a frontal or posterior one. The dentist will properly examine your case, do the necessary research and let you know whether you are a good candidate for implants. Some patients might not be able to get implants due to the lack of bone. These days, that factor is handled by an artificial bone graft. The ideal use of implants is for a missing tooth. Patients shouldn’t get the idea that they should extract teeth in order to get implants for a better smile. The thing is that implants do provide good aesthetics, but so do crowns. So if the tooth can be treated with a crown, that should be the first treatment choice. Also there are many factors that influence the appearance of an implant. First of all, the quality of the dentist, the gum phenotype, bone condition, type of implant, type of crown, and more. The procedure is done through the course of several months. The first step is placing the implant inside the bone. There are several approaches, but in general, the surgeon does a very small cut, and places the implant inside the bone with rotary instruments. He sutures the cut, and the patient has to wait for several months for the implant to connect with the bone. 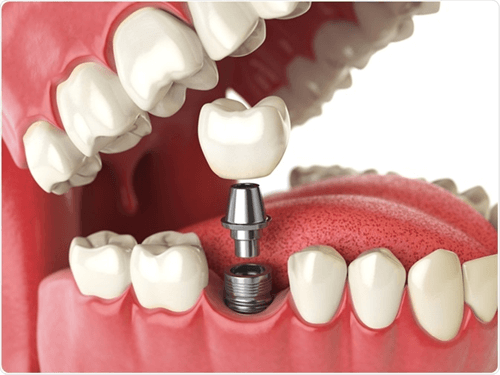 During the following visit, the dentist will place the abutment, a small part that connects the implant with the future crown. Once the abutment is done, dental technicians will deliver a crown that looks very much like a natural tooth. Dental implants have so many uses in dentistry. The first one is a lost tooth. They can easily replace any missing tooth. 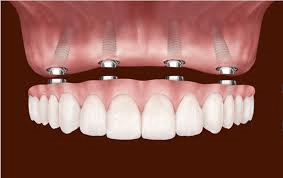 The second one, that most people are not aware of, is that implants can carry a partial or complete denture. That makes them an ideal solution for patients that don’t have any teeth left. Other common uses are in orthodontics.